I love using fabric to change the decor in my home. Other than paint, it is by far the easiest and most affordable way to completely change the look of a room. 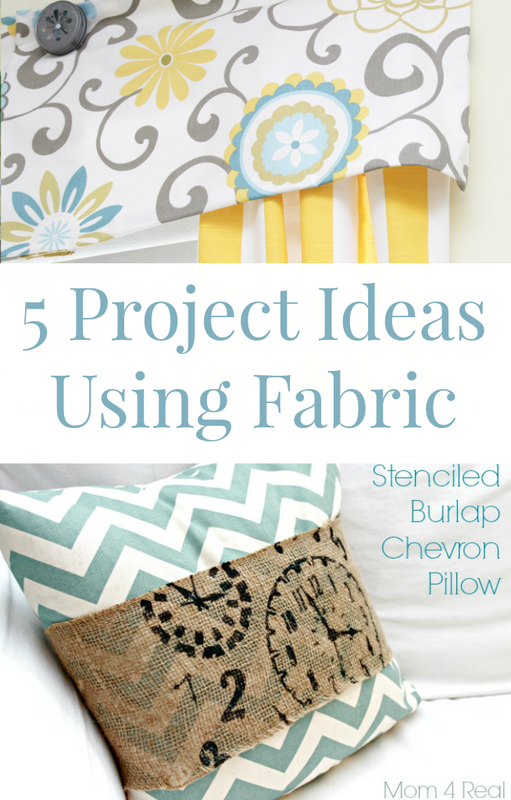 Today I want to share 5 fabric project ideas with you. These are all projects that I have done myself. I am not a master sewer, and seriously can barely sew a straight line…one of them is even a no sew project! I hope they help inspire you to grab some fabric and get decorating! Have no sewing skills? 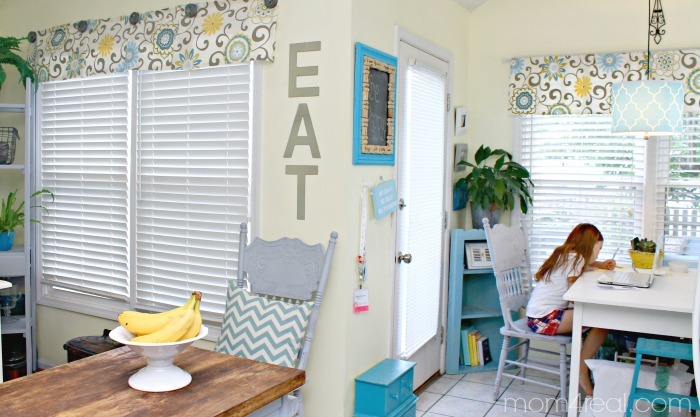 Then this post on How To Make a No Sew Valance is perfect for you! All you need is a hot glue gun, some fabric and nails…seriously…they are that easy! 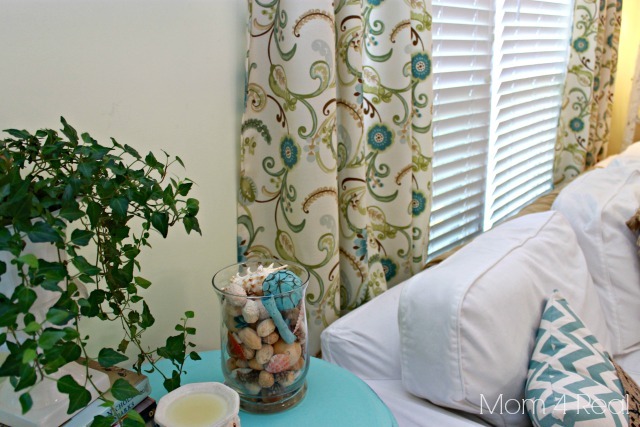 Here, I added a couple of curtain panels under my no sew valances…I love the way they frame out the window! You can find the tutorial for these super simple panels below! These Easy Sew Panels took less than an hour to make and are almost identical to a set that I almost bought for $50! Making them yourself is definitely less expensive, and makes it easier to change them out whenever you like! I am absolutely in love with throw pillows, which can be an expensive problem. Most of the one’s I love range between $20 – $30! Making my own is the only way to go. 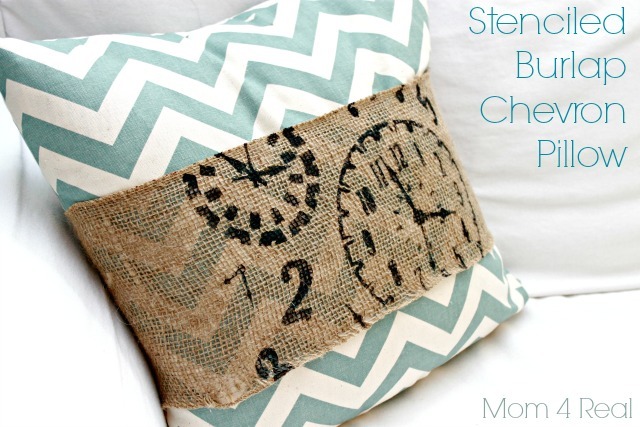 You can get a little more creative when making your own pillows too…for this I stenciled the band on this cute Chevron Throw Pillow and gave it a custom look…I also shared a cute pillow with my state’s silhouette that you’ve got to see! Here, I used some gorgeous coral fabric to completely change the look in my living room. I used the same easy sew tutorial from above and Refreshed My Space using this fun fabric! The great thing about using fabric to make your own curtains, pillows and more is that you can change them out as often as you like! 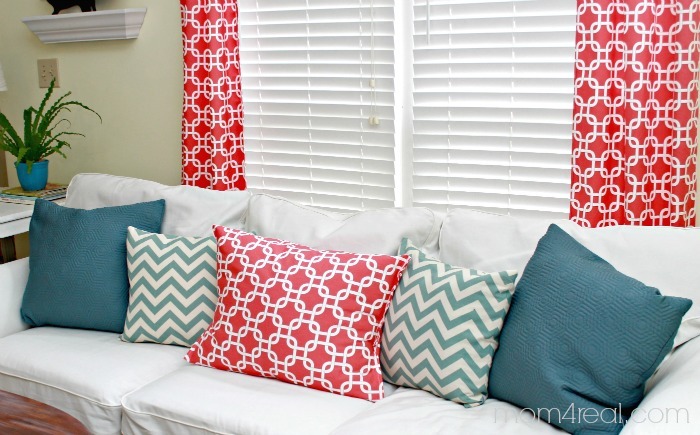 I have been known to exchange the curtains from my bedroom with the ones in the living room, and those chevron pillows have made it around to nearly every room in our home! I can’t wait to share some more fabric projects with you…I currently have a bench that needs recovering and some wicker chairs that will be getting new handmade cushions! Now…where do I get all of this gorgeous fabric??? You can follow OnlineFabricStore.net on Facebook, Twitter, Pinterest and Instagram! 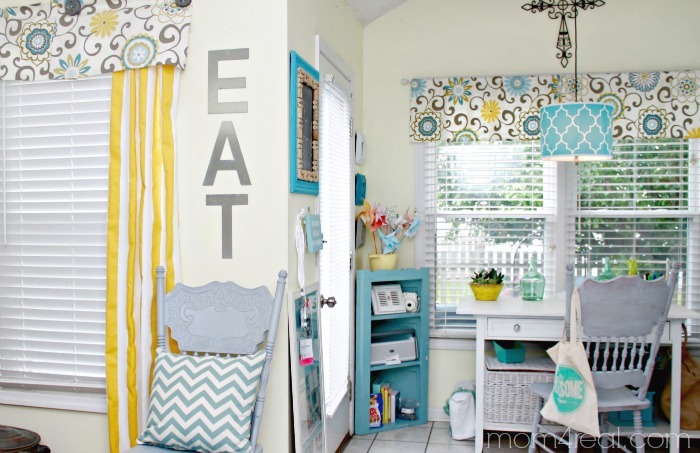 Hi where did you get that fabric for those valances(and do you know the name)? I’ve been looking everywhere for that! Seriously, you ROCK! I”ve- no joke- been looking for it for atleast 6 months! Thank you so much…love how happy your decor looks! Where did you get your lampshade? Thank you!